Robert John Sayers, a distinguished-looking Queensland miner, once mistaken for a bushranger, was born on 27 January 1845 at St Lawrence on the Isle of Wight, the son of James Alexander Sayers, a coast guard officer, and his wife, Emma, née Gover. Sayers’ education took place in schools at Cowes and in London before he arrived in Queensland about 1863. He became involved in the mining industry at Crocodile Creek near Rockhampton, then in New South Wales at Weddin Mountain and Grenfell. In 1867, he returned to Queensland where he visited mines at Gympie, Yabba, Mt Wheeler, Dee River, Herbert Creek, Mornish and Table Mountain. In 1871, he went to the Peak Downs area, but after feeling ‘so hungry he felt like chewing pebbles’, he tried the Ravenswood district and then the Seventy Mile Rush. When gold was found at Charters Towers, Sayers was among the first four or five dozen to arrive there. After some limited success, he invested in packhorses and set off to the Palmer River district where he made a good profit between Cooktown and the Palmer. He returned to Charters Towers and purchased shares in several mines including the Captain, Imperial,Just in Timeand Day Dawn United Mines. He became a manager. It was said that he could turn his hand to anything from driving an engine to sharpening tools. 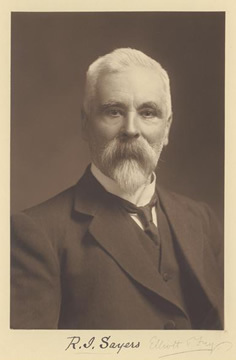 Sayers was elected on 12 May 1888 to the Queensland Legislative Assembly as one of the two members for Charters Towers. Described as ‘an ardent Liberal’ and a protectionist, he was active also in an anti-separation league, probably at Charters Towers. He took his place in the Queensland Parliament as a Ministerialist, but, standing as an Independent at the 1893 election, lost his seat when the miners’ vote was captured by the rising Labor Party. He stood again at the elections of 1896 and 1904 as a Ministerialist; and was unsuccessful on both occasions. Nothing daunted, on 12 December 1906, Sayers stood for the Senate as an Anti-Socialist candidate. Affirming that he represented ‘the whole of the Anti-Socialistic organisations in the North’, ready to ‘haul down the flag of Socialism’, his electoral platform included improved communications for Queensland and support for White Australia; he was opposed to nationalisation of the mines, and a keen advocate of the development of northern Queensland. With Chataway and St. Ledger, Sayers was one of the three Queensland Anti-Socialist Senators. True to his election promises, he quizzed the Government on telegraph charges, on the tardiness and expense of the royal commission on postal services; and, prior to the introduction of uniform postage, sought reassurance that stamps of one state could be used in another. He argued for properly qualified engineers to effect repairs at sea, and for the adoption of international maritime standards on Australian vessels. Anxious about northern defence, he supported the maintenance of the defence connection with the British Empire: ‘The States of Queensland, Tasmania, and Western Australia are not in a position to be taxed heavily to build up a Navy that would be of any use to us. We have not the means’. Somewhat plaintively he said: ‘We in the north are a long way from the Federal Capital. If a man were to go by the fastest route from here to the north, it would be seventeen days before he could get back . . . Our communications occupy several months in transit. What we ask for we seldom get . . .’. His contributions to debate reflected his practicality, his life as a miner in the outback, a natural intelligence, and an awareness of the issues affecting his fellow Queenslanders, which had led him to represent them in the Parliament. Describing himself as a ‘moderate protectionist’ he stated: ‘I believe in a Tariff that will bring revenue to the country, and in bounties that will assist in developing industries, but I do not believe in putting on prohibitive duties for all time’. He opposed duties in cases where such duties raised minimal revenue and were to the detriment of the consumer. His arguments were laced with personal experience and illustration and displayed a broad knowledge of industry. A slight upset resulting from eating bad imported fish prompted him to query import duties on cod on the basis of inferior processing practices. And in opposing higher protective duties on farming and mining machinery, he put the view of the people he knew in the North—the miner, the small businessman, the less fortunate householder. He evidenced some distaste for large manufacturing interests in Victoria, and opposed duties which discouraged people settling ‘on country lands’. With the impatience of the self-made man of the bush, he was critical of long-winded debate in the Senate, and of ‘too much legislation’. ‘What have we to show for all the talk we have had? If we have two or three inches of rain in Queensland it does more good to the country than all the legislation that the one hundred and eleven men sitting in Parliament House can pass’. Sayers early voiced Queensland’s dissatisfaction with Federation and declared his aim to see ‘some fair play for us in the North’. He said that he declined ‘to hand over the lands of Queensland to the tender mercies of the Federal Parliament’. In response to a taunt from Senator Gregor McGregor to the effect that Federation had already brought this about, he replied: ‘I admit that . . . we did a great deal blindfolded, but our eyes have since been opened . . . I believe that, if certain portions of the State were polled to-morrow . . . there would be a minority in favour of Federation . . . Dissatisfaction with Federation is expressed in all the centres, even in the manufacturing centres’. In debate on the Conciliation and Arbitration Bill, he opposed the proposed jurisdiction of the Arbitration Court over state employees: ‘I should be one of the first to protest against interference by a State with the functions of the Commonwealth, and I think it is also my duty to see that the Commonwealth does not trespass on the domain of the States’. He reiterated some of the fears felt before Federation when he said that: ‘the people of Melbourne can easily bring pressure to bear upon Ministers, who would smile at a leading article in the papers of Northern Queensland’. He complained bitterly about federal bureaucratic processes, which impacted unfavourably on the citizens of Queensland. Sayers’ deep love for Queensland, and especially for the north over which he had roamed in search of gold, was expressed in a nice feel for language: ‘Bananas grow in Brisbane and all along the Queensland coast, but when you get to the far north they are grown to perfection . . . Before the white man came bananas grew wild in the scrub there, and they can be grown for ten months in the year . . . I have lived in the north for the last thirty-five years’. The only thing he could say against Queensland was that it suffered from periodic droughts. But he went wider than Queensland. This unashamed ‘Aussie battler’ declared: ‘Personally, I have every reason to be grateful to Australia. I came here when I was a young man, and I have battled my way through’. In 1911, Sayers was one of those chosen to represent Australia in London for the coronation of George V. He was defeated at the federal election of 1913; once again in his political career, he had fallen prey to a Labor victory. He retired and lived privately until his death on 12 May 1919 at his home in Bowen Terrace, Brisbane. He was buried at Toowong Cemetery following a simple Church of England service. Unmarried, he was survived by his sister, Clara. Boomerang (Brisbane), 16 June 1888, p. 13; Queenslander (Brisbane), 17 May 1919, p. 12. Brisbane Courier, 5 December 1906, p. 5, 11 December 1906, p. 5. CPD, 2 August 1907, p. 1330, 9 August 1907, p. 1685, 15 August 1907, p. 1927, 16 August 1907, p. 2029, 4 November 1909, pp. 5289–5291, 5297–5298, 19 October 1910, p. 4746, 27 September 1910, p. 3741, 28 September 1910, p. 3787, 13 October 1910, pp. 4518, 4510, 4519, 11 July 1907, pp. 389, 392. CPD, 5 February 1908, p. 7822, 11 July 1907, p. 381, 11 February 1908, p. 7951, 10 March 1908, pp. 8746, 8747, 7 February 1908, p. 7917, 5 February 1908, p. 7801, 23 January 1908, p. 7621, 11 July 1907, pp. 385, 383, 380. CPD, 11 July 1907, pp. 386, 379, 18 August 1910, p. 1725, 11 July 1907, p. 386, 25 March 1908, pp. 9532–9533. CPD, 6 February 1908, p. 7855, 11 July 1907, p. 380. Brisbane Courier, 14 May 1919, p. 11; Queenslander (Brisbane), 17 May 1919, p. 12. This biography was first published in The Biographical Dictionary of the Australian Senate, vol. 1, 1901-1929, Melbourne University Press, Carlton South, Vic., 2000, pp. 115-117.